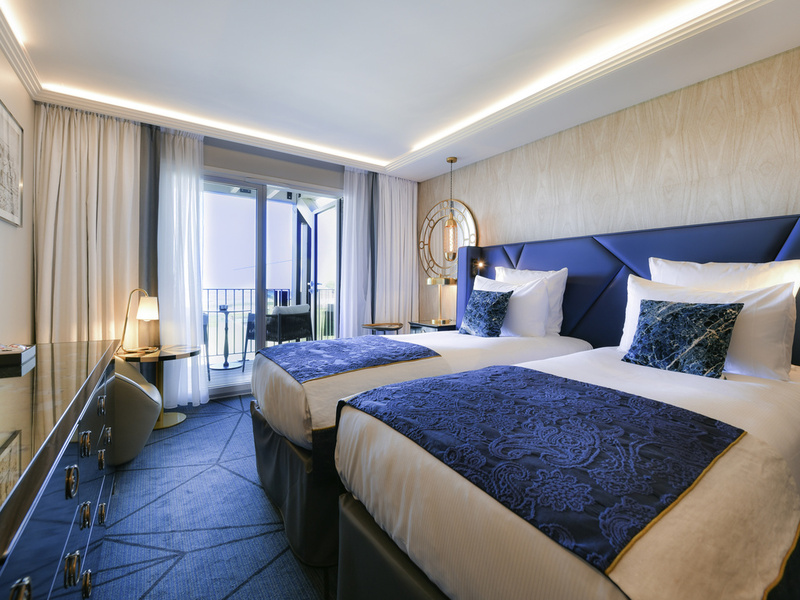 La Grande Terrasse Hotel & Spa La Rochelle MGallery by Sofitel invites you to let your mind wander beside the ocean, just a stone's throw from the Châtelaillon-Plage thalassotherapy center. Access to the pools at the seawater spa, as well as at the Nuxe Spa within our 4-star boutique hotel, is included in your stay. Enjoy a wellness break during your leisure weekend or a team building activity during meetings or seminars. 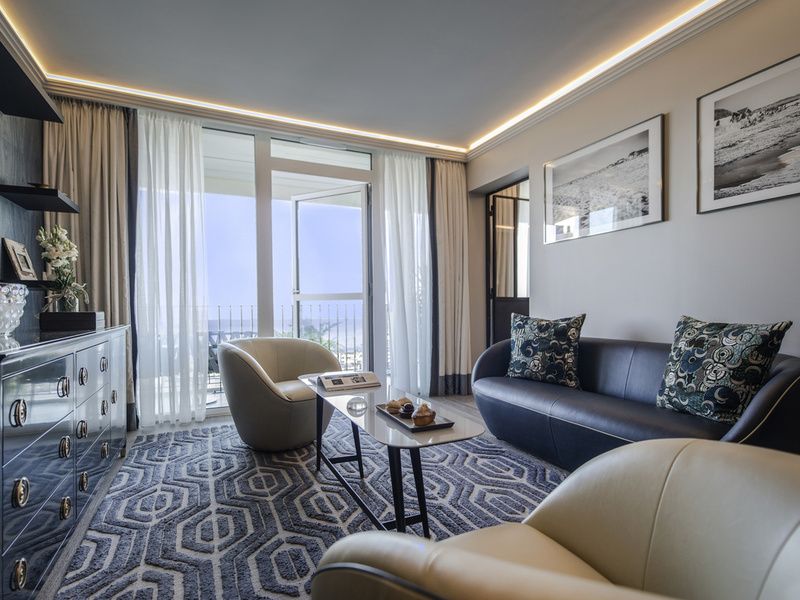 Inspired by the sea, our hotel's interior design combines gentleness and light, while the cozy rooms and bright restaurant ensure a soothing and intimate atmosphere. Discover the Gaya restaurant with generous seafood cuisine by Pierre Gagnaire. 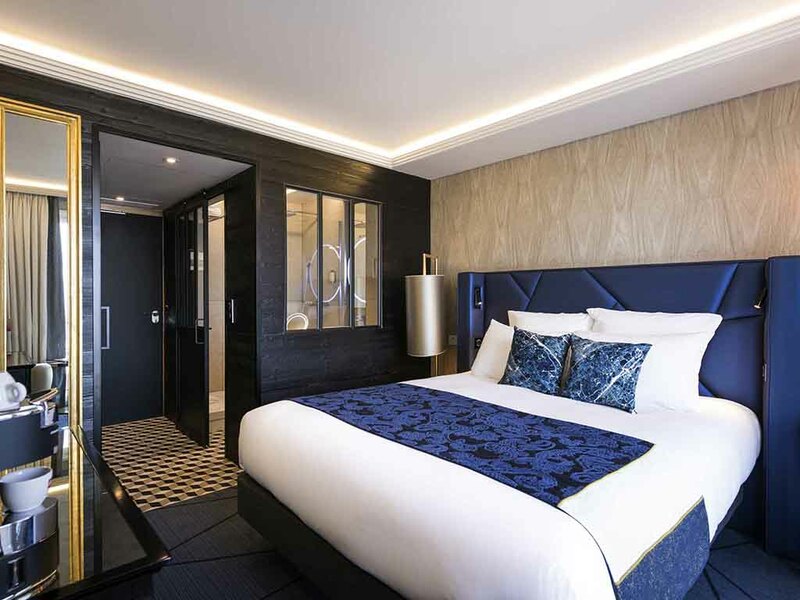 Surrounded by 7.4 acres (3 hectares) of greenery, La Grande Terrasse Hotel & Spa La Rochelle MGallery by Sofitel offers a getaway in total harmony with the elements, on the edge of the dynamic city of La Rochelle. Discover Gaya by Pierre Gagnaire, a refined yet affordable restaurant. Enjoy a 180-degree view of the ocean and soothing interior design based on blues and sandy colors. Discover the treatments that this famous brand has to offer in our luxurious spa in the heart of the hotel. One day, a man, a Charentais project, a fishing hut. Alban Curnillon, marine carpenter, created Le Carrelet de La Grande Terrasse opposite the hotel, on the ocean coastline, with a sustainable approach, respecting nature. Soak up your surroundings with a 180-degree view of the islands of Ré, Aix and Oléron amidst the vastness of the Atlantic Ocean. From the privacy of your room to the culture of La Rochelle, a luminous energy will help you rediscover your vitality. Watch the waves dance from the hot tub at the spa, re-energize on our bar's sunny terrace and savor delicious dishes made with the freshest local produce and devised by our chef, Pierre Gagnaire. Experience your own private sunset from our jetty over the ocean. Make your way to the authentic fishing hut at the end of the jetty to prolong this Memorable Moment by tasting an exclusive selection of local oysters. Stroll along the terraces lining the Vieux Port to its two majestic towers. Enjoy the riches of the museums and the fascinating aquarium. From the vast beach in Châtelaillon, the islands and Fort Boyard invite you to explore the region's treasures. Located 20 minutes from La Rochelle train station and La Rochelle-Île de Ré Airport, the hotel invites you to book one of its complimentary luxury shuttles for your transfers. The journey from Paris is approximately 2 hours 30 minutes via TGV train. 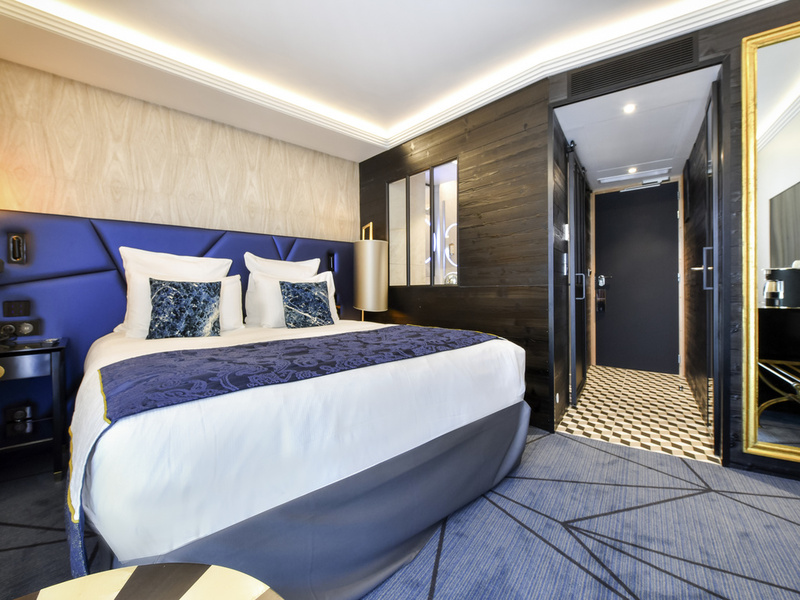 Choose one of our rooms as your base at the gateway to La Rochelle. Ranging from 205 sq. ft. (19 m²) to 237 sq. ft. (22 m²) with balcony or terrace and views of the landscaped garden or the ocean. We have the perfect room for your stay on the coast. All our rooms boast radiant brightness, a harmonious blend of fine and natural materials, and soothing blue and sandy tones. All room categories include access to the Nuxe Spa and seawater spa. 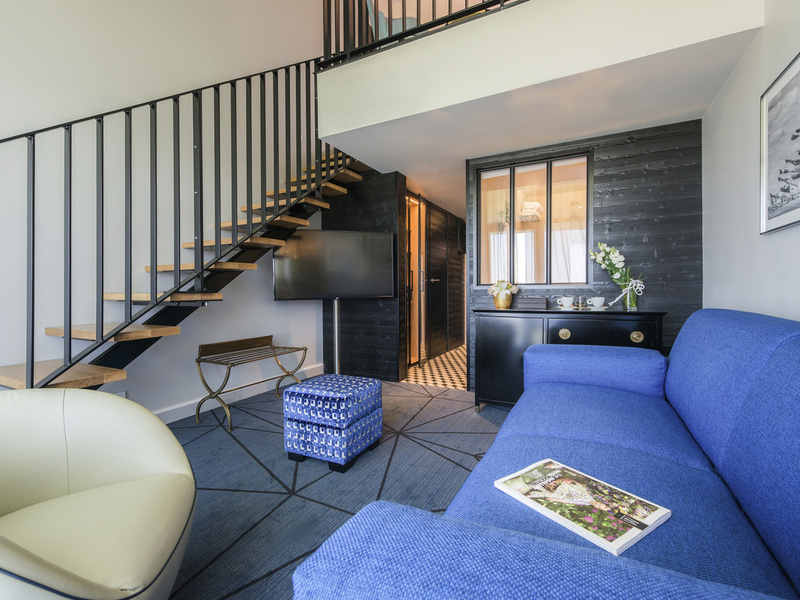 Our Duplex Suites with living room and mezzanine offer enhanced comfort. Another Suite, La Demoiselle de l'Océan (the damsel of the ocean) - a nickname for dragonflies - is a haven of total luxury to take refuge or set sail and get away from it all. Room measuring 205 sq. ft. (19 m²), 49" TV, Illy coffee machine, bathrobe, slippers, minibar, bathroom with walk-in shower, crib on request. Access to the heated swimming pool and hot tub, hammam, sauna and gym included. Room measuring 237 sq. ft. (22 m²), 49" TV, Illy coffee machine, bathrobe, slippers, minibar, bathroom with walk-in shower, crib on request. Access to the heated swimming pool and hot tub, hammam, sauna and gym included. Duplex measuring 344 sq. ft. (32 m²) with sofa bed, mezzanine bedroom with stair access, bathroom with walk-in shower and bathtub, 55" TV, minibar, bathrobe, slippers, Illy coffee machine. Access to heated swimming pool and hot tub, hammam, sauna and gym. Room measuring 431 sq. ft. (40 m²), bathroom with walk-in shower and bathtub, 55" TV, minibar, bathrobe, slippers, Illy coffee machine. Crib available on demand. Access to the heated swimming pool and hot tub, hammam, sauna and fitness room included. Savor the culinary talent of the restaurant team in the privacy of your room. Breakfast on your balcony or terrace, snacks during a work session... Room service provides you with a delicious break at any time of the day. Among the restaurants in Châtelaillon-Plage and La Rochelle, the Gaya is truly exceptional. As well as panoramic views of the islands, the creativity of the dishes and its interior design, its fresh and authentic cuisine truly sets it apart. Promising a moment of relaxation beside the ocean, this bar opens out onto a vast terrace and boasts a chic intimacy. Let yourself be whisked away with an exotic cocktail or a local cognac. Our star chef has created a unique menu using the best produce from this coastal region. Blue and sandy tones illuminate the rooms with décor inspired by the ocean floor. You won't be able to take your eyes off of the view over the never-ending ocean from the terrace or panoramic room. A major destination in Châtelaillon, this restaurant combines regional seafood with a fascinating wine cellar. The star chef is at his creative best to ensure the mouth-watering presentation of his recipes shines as bright as the superb panoramic view. With healthy drinks and trendy cocktails, the hotel's bar will tempt you with its menu as well as its bright terrace overlooking the ocean. Sample the sparkling signature cocktail, a delightful surprise full of freshness. Whether for a seminar or marriage, the meeting rooms at La Grande Terrasse Hotel & Spa La Rochelle offer an elegant setting with ocean-inspired décor for your events. Six modular rooms with high-speed Internet can accommodate from 2 to 120 people. Add some creativity to your meetings with the natural light and inspiring ocean view from our meeting rooms. Ride a Segway, play golf or enjoy an oyster tasting experience - our team will guide you through innovative team-building activities. Organize a thematic cocktail event or a spectacular product launch. 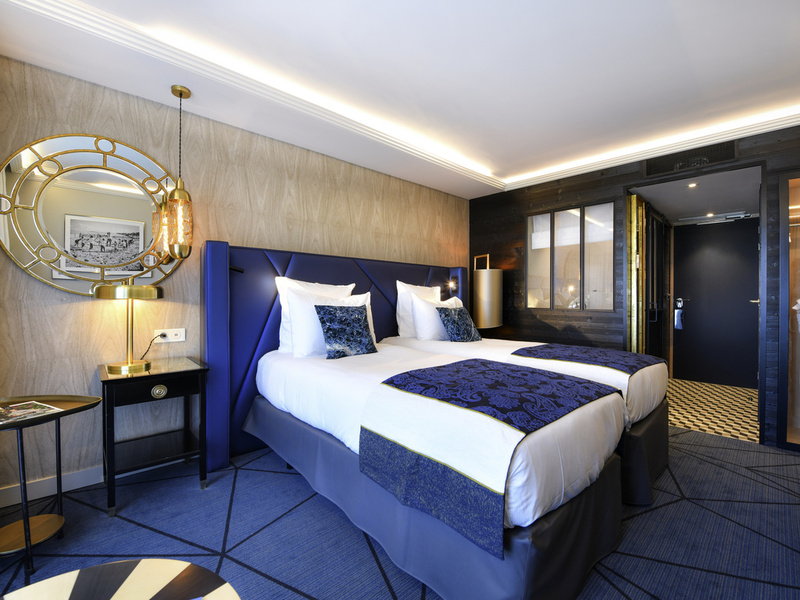 Make the most of our team's advice and experience to configure your room, customize your gourmet breaks and leave guests with unforgettable memories of your event. For your marriage, combine the backdrop of the ocean, the Southwestern sun, impeccable service and an attentive organizer to meet all your needs for the most beautiful day of your life. Book the banquet room or reserve the entire restaurant. Experience an unforgettable honeymoon. At the hotel, treat yourself to a couple's massage at the spa, take a sunset stroll on the beach and enjoy a romantic dinner. Our concierge will advise you on visits to La Rochelle or help you book a cruise. Discover à la carte Nuxe treatments at the spa. After relaxing in the sauna and hammam, explore the 31°C swimming pool aquatic course. The swimming lane leading to the whirlpool bath seems to join the ocean, providing an unforgettable moment of wellbeing. Free access to the seawater spa, just 109 yds from the hotel, for a thalassotherapy session. Discover the many attractions in Châtelaillon and La Rochelle by shuttle or in your vehicle. Our free car park has three electric vehicle charging terminals. Ask the concierge about discovering the region's countless activities. Take a cruise to the islands or book one of the luxury private shuttles at your disposal to reach La Rochelle city center, airport or train station. Enjoy the Nuxe Spa at the hotel and the seawater spa located just across the road from the hotel. Both have indoor swimming pools, aquatic courses, swimming lanes and outdoor whirlpool baths heated to 31°, hammams, saunas and ice fountains. Head to the fitness center for a cardio session. Make the most of Technogym expertise on the treadmill, rowing machines and bicycles, while enjoying the beautiful natural view. Enjoy a custom program designed by our sports coach.